Flying from Sarasota to Bucharest reminds me of the old saying, “You can’t get there from here.” Well, actually you can, but it’s not easy. After long layovers in Atlanta and Amsterdam, we arrived in the capital of Romania thirty hours after our flight left Sarasota, jet-lagged and exhausted, for the start of a 24-day Tauck cruise on three of the world’s great rivers: the Danube, the Rhine, and the Main. The trip began with two nights in Bucharest at the J. W. Marriott Grand Hotel, a beautiful facility in the city center directly across from the gigantic People’s Palace (more about that later). Our first morning in the city dawned cold and rainy, which seemed to suit the day-long tour we chose: a long bus ride to the mountains of Transylvania and Bran Castle, a fortress used by Vlad the Impaler (better known as Dracula) during his military campaigns in the 15thcentury. Interestingly, the name “Dracula” has nothing to do with vampires, but just means “Son of the Dragon,” his father having been a member of the medieval Hungarian chivalric Order of the Dragon. Vlad is seen by Romanians as a sort of Balkan Robin Hood, a brilliant fighter and strategist who fought the Ottoman Empire during its long – and largely successful – attempt to take over the entire region surrounding the Black Sea. Vlad’s reputation for extreme brutality, even in a brutal period, culminated in his being called “the Impaler” because of his favorite and particularly gruesome method of dealing with his enemies. To illustrate his creative brand of cruelty, there is a story, perhaps apocryphal, about a dinner to which he invited several boyars who had adopted the Muslim custom of wearing turbans. Vlad hated Muslims, having spent his life at war with them, and demanded that they remove their turbans, knowing that they would refuse. When they rejected his demand, the servant who stood behind each boyar with food and wine stepped forward with a hammer and nails and firmly attached the turbans to the guests’ heads. Bran Castle itself is a beautiful stone fortress, built in the 13th century in the Carpathian Mountains as a defense against invaders who had to use the narrow pass to reach the lowlands. In the early 20thcentury, the castle was given to Queen Marie of Romania by the people of her country in appreciation for her service, and she used it as a summer retreat for years. Now a cultural museum and a major tourist attraction, it gives modern visitors a sense of what life must have been like centuries ago (although the furnishings are not from the medieval period). 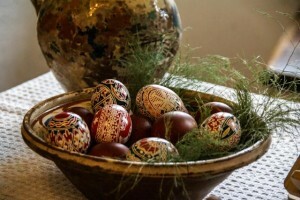 In one of the small rooms, a table was set for Easter, with beautiful rustic breads and a basket of elaborately decorated eggs. We climbed winding steps encased in stone walls so narrow we couldn’t imagine how a very large person could keep from getting stuck. We ducked under low archways to reach rooms with spectacular views through arrow slits across the valleys on either side of the fortress. The dark oak beams that support the walls and ceilings of the rooms date from the time of the castle’s construction and are still as sturdy as they were 700 years ago. The central courtyard, with its cobblestones and picturesque well, could have served as the stage set for a Rossini opera. What was intended for defense has become a charming fairytale castle, making it easy for us to forget its long and bloody history. Even on a gray and rainy day, and even after an arduous climb from the village of Bran 250 feet up an uneven rocky pathway to the castle steps, it was a memorable experience for us. Afterwards, we had our first encounter with what Romanians consider a simple lunch. We walked from the castle down a narrow street to a restaurant called Popasul Reginei (which I think refers to the Queen of Romania, the Romanian language having evolved from Latin), where four small deer entertained us from their paddock outside the windows. The tables were set with blue-patterned Bohemian china and wine glasses, and at each place was a large plate of artfully arranged antipasto, which we assumed was our lunch. Wrong. The next course was grilled chicken and beef, accompanied by a salad. And then came dessert and coffee. The whole meal was liberally laced with Romanian wine and beer, so when we finally (after two-plus hours at the table) waddled out to the waiting bus, we had no trouble sleeping all the way back to the hotel. If Romanians eat this way at lunchtime, we can’t imagine what their dinners must be like. By the way, we saw no gypsies during our time in Romania, although they do make up part of the population. I asked our guide about the origin of gypsies, who are sometimes called Romani, because I’d thought they might have originated in Romania. On the contrary, other European countries have a much larger concentration of gypsies, and their place of origin is shrouded in mystery. The word “gypsy” is derived from the word “Egypt,” since at one time gypsies were thought to have come from there. It seems more likely that they originated further east, perhaps even in Mongolia, but no one knows. 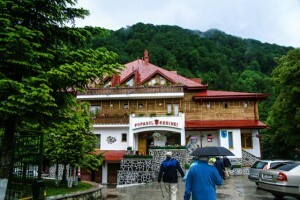 The Romanian countryside is very beautiful, rain or shine, with broad plains planted with wheat and barley and sunflowers, then the rolling foothills of the Carpathian Mountains, and finally the mountains themselves, forming a natural barricade between the northern and southern parts of the country. We had heard of the Balkans, of course, but we must admit that before we planned this trip, we wouldn’t have been able to locate Romania on a map. We expect to be much better educated about this part of the world by the end of the cruise. 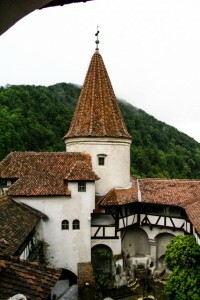 If you’d like to see more pictures of Bran Castle and our visit to Transylvania, click here. Next installment: Bucharest, the “Little Paris” of the Balkans. This entry was posted in European River Cruise by judgelolly. Bookmark the permalink.